Posted on November 18, 2014 by Lisa Johnson, Ph.D. 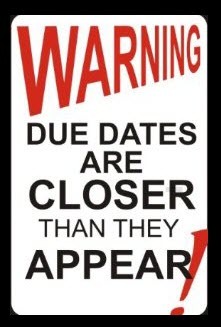 Please do NOT treat the “Due Dates” for participation in our course discussions as the “Do Date”…Set your class study and participation routine so that you can post early and often during the week. Avoid posting only on the close date/due date of our discussions! Imagine you were taking your course in a place-based modality (i.e., on a physical campus) and let’s say you had classes where discussions took place two or three days a week for an hour for each class. Next, I’d like you to imagine that for that campus course you made it a habit of arriving to each class during the last 5 minutes. When you arrived, you contributed a lot of information and questions to consider. Given there are only five minutes in the class remaining, you might not expect much interaction from me or your class peers, would you? In fact, you might be viewed by peers as not really caring about them as teammates in the class environment and you could be looked at as being rude! …the same is true online, in a sense, for an online class discussion that has been going on for an entire week! Waiting until the final day to participate and final hours on that final day of an online discussion that has been ongoing on for a week is similar to walking into a land-based class in the last minutes and demanding or even just expecting a quality level of interaction or learning… Your professor, that’s me, and your classmates have already been engaged and are wrapping up the conversation when you arrive on the last day and hours of an online discussion; quality learning opportunities and the deep instruction and engagement you are paying for in the class experience are just not going to happen! The final day of an online discussion, if anything, like the final minutes of a face-to-face class, are about reflection, debriefing, and digesting what has been said and preparing yourself for what is to come or asking for clarification on things from the class/discussion that are unclear to you. YOUR “DUE” DATES ARE NOT INTENDED TO BE YOUR “DO” DATES! Thanks for this interesting post. While I try not to post late, often I can’t post until the weekend “due date” due to life circumstances. The difficulty I have with online discussions is they don’t take advantage of their asynchronous nature and merely replicate an in class discussion. These forums are slated to support the early poster. There are several things that could happen to change the dynamics and take advantage of the medium. One would be to move away from the arbitrary Sunday/Monday start. If you made Wednesday or Thursday the “start” of the week you could give busy people (I’m in a masters program so everyone is working) the “mid-week” weekend to respond and interact. Given, some people will still leave their participation until the end but I think it would help with participation. A second idea is to create smaller groups for discussion or assign a small group each week to be the original poster and everyone else responds. They become the moderators (along with the instructor). This would help build engagement as I’m not “beaten to the punch” each week by the same earlier posters. Third, and it sounds like you do this in your course, as an instructor moderate and co-construct the discussion. Play devil’s advocate. In my online masters courses I have heard from the professor perhaps (arbitrary % here) 5% of the time in discussions. They just aren’t there. I’m going to be more involved if I’m pushed to defend my ideas or supported to explore an idea further by the “more knowledgeable other”.